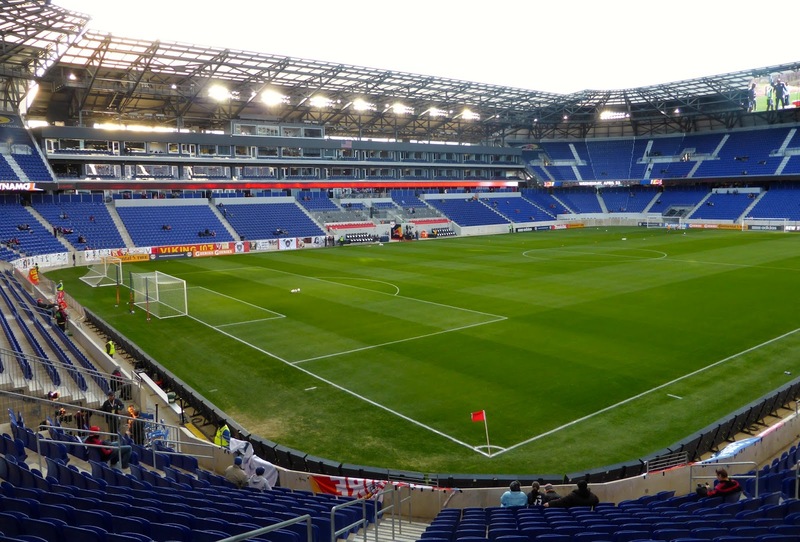 The Giants and Jets are not the only New York teams to play out of New Jersey as the Red Bulls of Major League Soccer host games at the Red Bull Arena in Harrison. The sponsorship doesn't end there as Red Bull drinks are prevalent with all concession stands carrying six varieties of the stuff at just $3, cheaper than soda or water. Of course, the logo on the seats is that of the brand as well. MLS has gained popularity in recent years and now has 19 franchises, with two more joining next season, including a second club in New York that is owned by the Yankees and Manchester City. The majority of the teams are outside the Eastern time zone (12 in all), yet the current divisional alignment has ten squads in the Eastern Conference and only nine in the West. Houston and Sporting Kansas City are the odd ones out and one or both are likely to move when the new teams join next season. 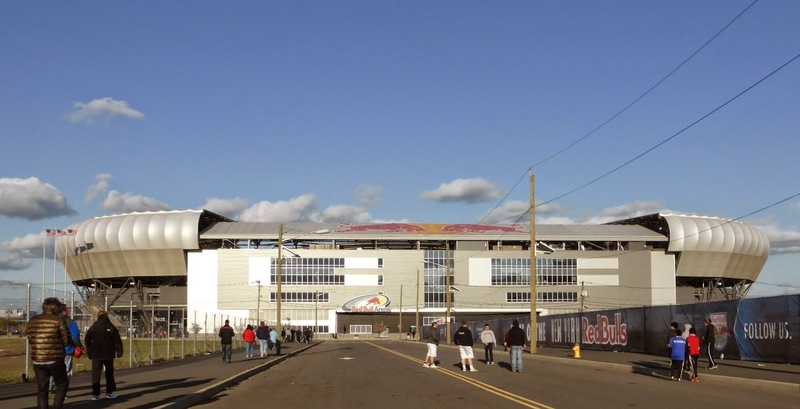 With games held only on a weekly basis, it is tough to add MLS stadiums to my venue count. I'm not going out of my way to see a game unless I'm already in the city for baseball or football. As such, I'd only seen one MLS game before this, three years ago to the day in San Jose. Like the NFL, a full-season trip would be the best way to check all of these off, but I won't be doing that anytime soon. For now, I'll try to visit a couple a year as part of my larger trips. 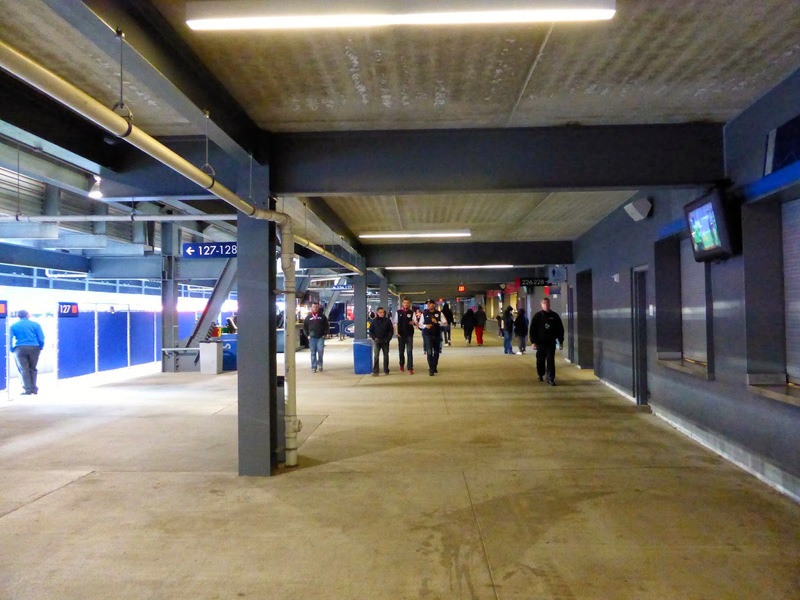 The stadium is easily accessed from Manhattan by taking the PATH Train to Harrison, which is one stop before Newark. The station is small and after the game you will suffer through a long wait to get back to the platform; sadly there are no bars in the vicinity to pass the time. The venue is reminiscent of European soccer stadiums, which makes sense as it was designed as a soccer-only facility. The lower bowl seats are right up against the pitch and the upper deck seats along the side offer great sight lines as well. Because soccer is so quick and the fans more serious, you don't need any bells and whistles to distract you. The concourse is barren, with only a few concession stands to tempt you with little more than your typical overpriced stadium food. At $5, hot dogs are probably the best value. Tickets start at $25, but you can find much better deals on StubHub, at least for these midweek games which attract fewer fans. I have heard that the atmosphere here can be very loud and energetic, but on this day, there were perhaps 10,000 fans in the 25,189-seat stadium and the bitter wind kept most of them huddled up instead of making noise. Even the supporters section was suffering from a relatively poor turnout, but that didn't stop the Red Bulls from putting on a classic performance. It's still early in the season, but both teams were out of the playoff picture, with the Red Bulls only managing a single win and four draws from their first seven matches, while Houston was 2-3-1, also good for seven points. 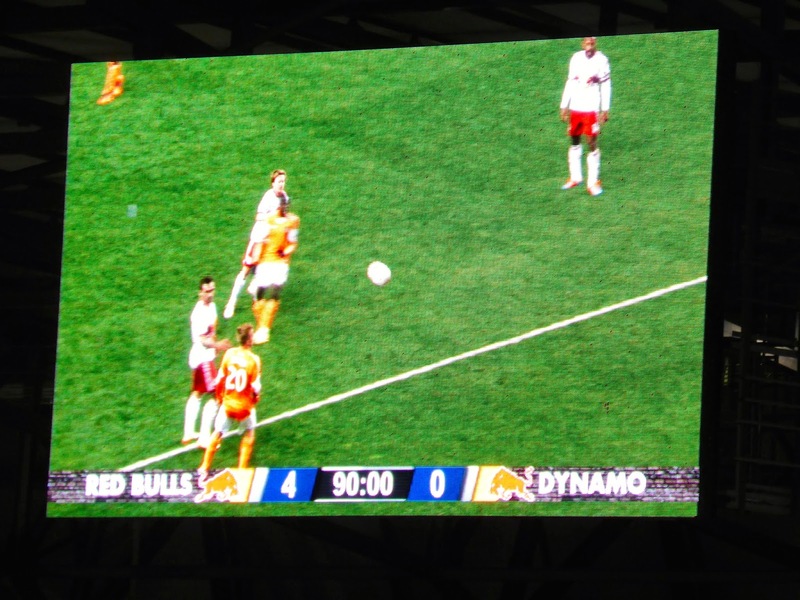 The Dynamo are one of the league's more successful franchises, with 2 MLS Cups (2006-07) and two finals appearances (2011-12) in their eight seasons. The Red Bulls boast Thierry Henry (below), a French superstar who is finishing his career here after 16 seasons in Europe, including a long stint with Arsenal in the EPL and three years with Barcelona in which his club won the Champions League. 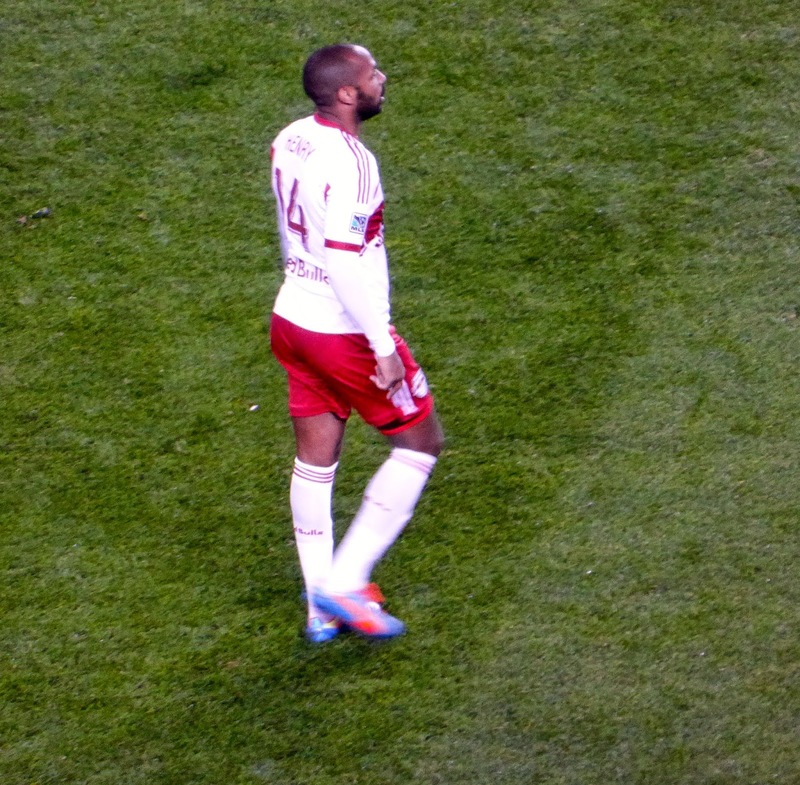 Last year, Henry led the Red Bulls to the Supporters' Shield (for the most points in the regular season) but the team was upset by Sporting KC, the eventual champions, in the playoffs. 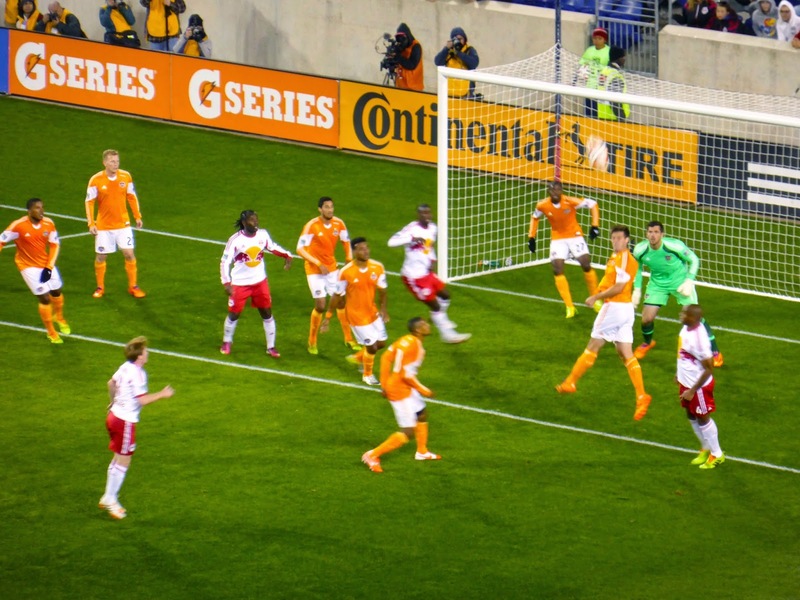 It didn't take Henry long to show his class, as he took a pass from Kosuke Kimura into space to the right of the Dynamo net and looked up to see Bradley Wright-Phillips completely unmarked. A quick pass and Wright-Phillips made no mistake tapping it by keeper Tally Hall just 12 minutes in. Exactly 12 minutes after that, Henry found Roy Miller down the left flank. Miller beat Warren Creavalle cleanly and crossed to Wright-Phillips who was again wide open and had an easy back-heel for the brace (that's two goals in a game for soccer neophytes). The second half saw Henry get into the act, scoring into the empty net on a rebound after Hall made a save on Wright-Phillips. It was incredible to watch Henry, who seemed to anticipate the rebound before the shot was even taken. Late in the game, the Red Bulls added another that was called back because a penalty had been awarded when Henry was fouled in the box. Wright-Phillips was asked to take the shot and he converted for the hat trick and the 4-0 final score. A comprehensive win for New York, and although Wright-Phillips will get the accolades, it was Henry who was the most impressive player on the pitch and a joy to watch. When comparing him to many of the Americans on both sides, it is obvious that the natural talent in other countries is still far beyond that available here. The continued growth of MLS will narrow the gap over time, but I doubt I will ever see a country from outside of Europe and South America lift the World Cup or even make the finals. Out of 19 World Cups so far, 25 of the 38 finalists have been from UEFA with the other 13 from CONEMBOL and based on what I saw, I doubt that will change this year. Hope I'm wrong though.